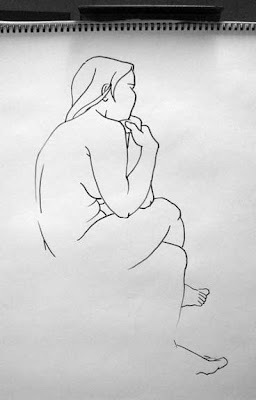 Every Friday there’s usually an open-drawing session in the art department from 4-6pm with a model. I try and make at least handful throughout the semester, and occasionally schedule make-up sessions as needed. My students are encouraged to get a jump on the figure drawing work that’s ahead in our own class by attending as many as possible, though part of the reason I personally like to go is that it’s not formal – there’s no “teaching” per say going on, and the focus is on your own work. Sometimes I just need the warm-ups myself, as I’m not practicing as much as I’d like to, or have in the recent past when I ran a sketch group. So this past Friday, due to the workshop gig, the figure drawing had to end an hour early so we could set things up. But I managed to get in a dozen gestures and one fifteen-minute pose that turned out pretty decent: here’s both the digital picture taken from the original drawing while on the easel, and the vectored version, cleaned up first in Photoshop and then tweaked in Freehand. Felt damn good to step up to the plate and knock one out of the artistic park, in part ‘cause that’s a rare enough thing these days. I like it best when it’s at its simplest; leaving the lines alone and not overworking it, which is a tendency with me when I fart around too much by adding value. Seems they are the most successful as plain contour line, and also with the whole “implied line” thing going on as well. Funny how even with a computer I still try and strive to recreate the effect of my older figure work, when I’d just use a stick dipped in ink. Is this the one you were telling me about? I love it!